First, fencing is a sport in continuous evolution. Training methods change based on new sports science knowledge. Our understanding of what works in bout tactics and seasonal strategy changes. How the rules impact how we train our athletes changes. Technique itself changes. Professions address change by continuing education; fencing is no different. If you want to give your fencers the best possible chance to be successful, you must regularly take advantage of continuing education opportunities to learn both from the presenters and from your fellow clinic participants. Second, the examination process is a learning process – just preparing for the examination makes you a better coach current in developments in theory, tactics, techniques, and training methods in the sport. Pass or fail, the examining panel will give you suggestions and feedback on how to improve your performance. And your students will benefit. Third, passing the examination shows that you have satisfactorily demonstrated to professionals in the sport who have long and wide experience that you have met a standard of excellence in teaching. It is a challenge. And it is the history of our sport. For over 600 years candidates have stood sword in hand before examining panels in Germany, England, France, Italy, Spain, the United States, etc. to prove their fitness for the title of one of the ranks of professional coaches. Salle Green LLC, in conjunction with the Pan American Fencing Academy, conducts a series of clinics each year to prepare fencing coaches for the professional examinations conducted by the United States Fencing Coaches Association. The USFCA is the nationally and internationally recognized professional organization for fencing coaches in the United States. Its certifications represent a portable credential recognized internationally by the Academie d’Armes Internationale. USFCA professional examinations require written testing (in the case of Maitre candidates a written thesis) and an extensive practical examination of teaching skills. A single written test is required at each level, but practical examinations are now weapon (foil, epee, or sabre) specific. Practical examinations range from 45 minutes to 2 hours in length, depending on the level of certification and the proficiency of the candidate. Individuals are certified in the weapon or as d’Armes upon completition of certification in all three weapons. Assistant Moniteur – a pre-professional coaching rank for individuals who are interested in becoming a coach and who teach simple lessons and help instruct in group lessons in their club. The practical examination is typically given in a group lesson setting. Moniteur – an entry-level professional coach who teaches beginner and intermediate fencers in either group or individual lessons. The practical examination is typically given in a group lesson setting. 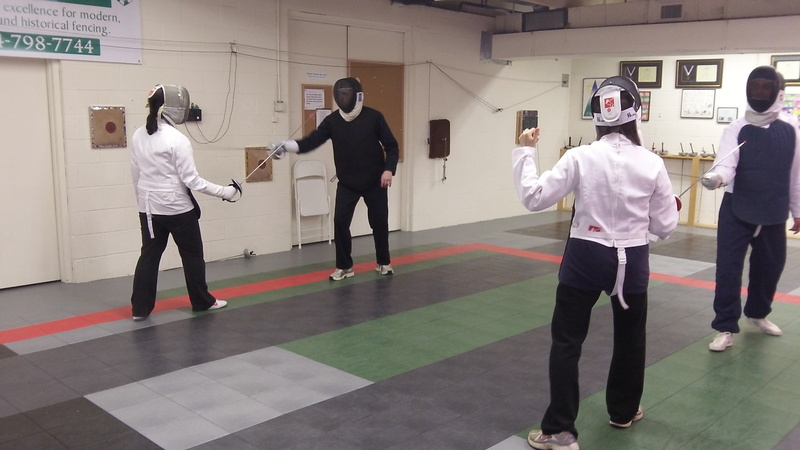 Prevot – a fully qualified professional coach who teaches individual lessons to advanced and elite fencers, including the full range of technique and tactics. The examination includes individual lessons: an options tactical lesson, a teaching lesson, and a competition warm-up lesson. Maitre (Fencing Master) – a coach qualified to design and conduct the full training program of a club, to train elite fencers, and to train other coaches. The examination includes individual lessons: an options tactical lesson, a teaching lesson, and a competition warm-up lesson. Proficiency in teaching with either hand is desirable. All clinics are one day clinics conducted use the standard syllabus of the United States Fencing Coaches Association National Training Program. The Assistant Moniteur clinic is a single one day clinic. Moniteur training is conducted in two one day clinics, typically spaced a month apart with specific assignments to be completed in the individual’s club. Prevot and Maitre training extends in four one day clinics with intervening work in the individual’s club. Assistant Moniteur and Moniteur candidates test at the end of the final clinic activity. We may be able to offer Prevot and Maitre testing at the final clinic or make arrangements for testing at the USFCA’s annual coaching conference. All coaching clinics are accredited by the United States Fencing Coaches Association and award continuing education hours for USFCA Center of Excellence annual renewal. 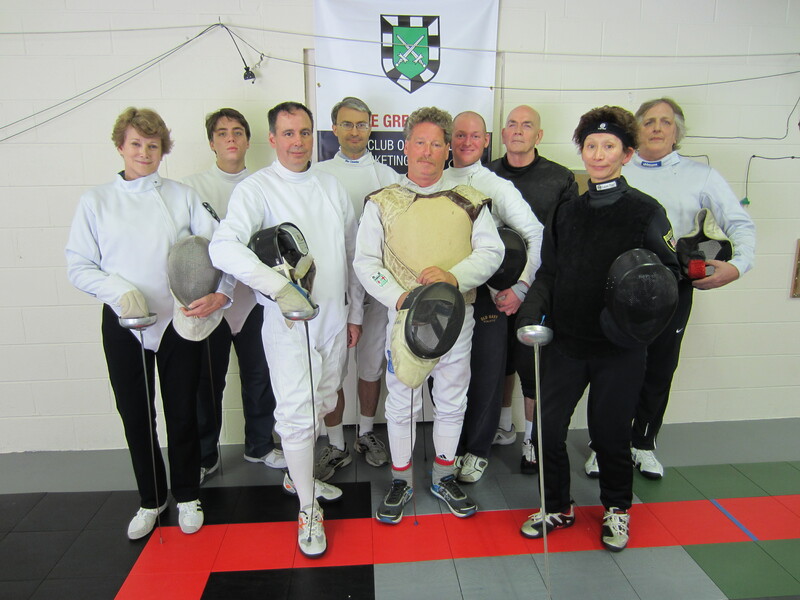 Clinics offered are listed on the Fencers Results and Events Database website. Asssitant Moniteur candidates working on their lesson plans in a USFCA clinic at the Salle. Teaching a good lesson requires planning the content and making certain that it fits into the current training mesocycle. 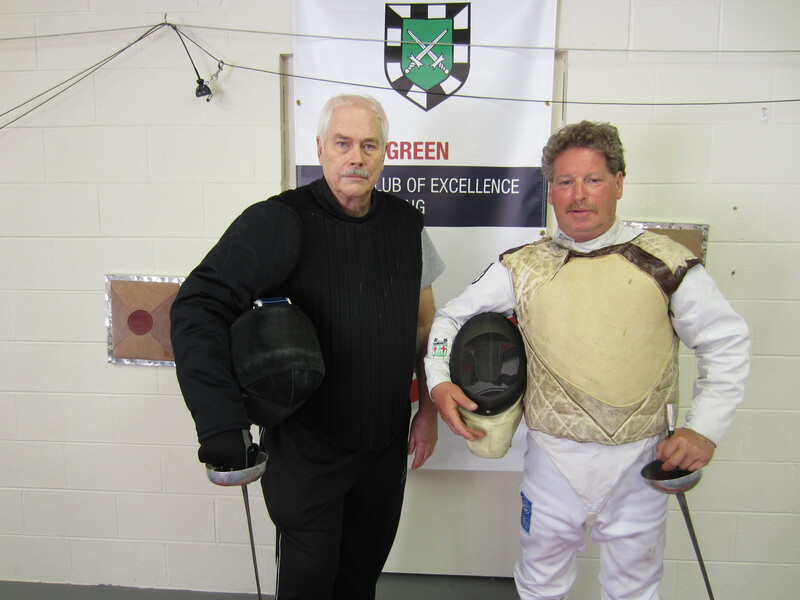 Salle Green also teaches clinics for coaches interested in providing training in historical fencing in their clubs and as continuing education for coaches interested in broadening their understanding of the history of swordsmanship. We currently offer clinics in Longsword and Rapier for those preparing for the USFCA’s Moniteur d’Escrime Historique examination. These single day clinics are taught using the standard National Training Program syllabus. For those interested in training in teaching classical fencing we provide training following the Classical Academy of Arms instructor qualification syllabus. This can lead to designation as an Apprentice Instructor, Classical Fencing Demonstrator, Classical Fencing Intructor, Classical Fencing Provost, and Classical Fencing Master. Because the CAA syllabus provides structured performance objectives for each level of credential, we use this framework for training all of our instructors. Qualification by the Classical Academy of Arms requires completion of written examinations on fencing in the classical period and on instructional methods, practical examinations in teaching, and at the Provost and Master levels significant written papers examining some element of classical fencing. 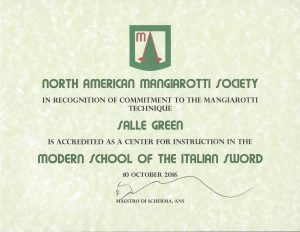 Salle Green is the first fencing program accredited as a Center For Instruction in the Modern School of the Italian Sword by the North American Mangiarotti Society. Maitre Green assisted in the presentation of the first clinic to qualify fencing coaches as instructors in Mangiarotti’s Technique, and four of our Trainers have been endorsed to teach foil, epee, and sabre. This training provides a grounding in the foundational skills of modern Italian fencing technique and a very combat oriented philosophy of fencing.